Organic Coconut Oil a real all-rounder – multi-purpose both in kitchen and beauty care. Extra native Coconut Oil in raw food quality is second to none in taste and nutritional value. It is rich in essential minerals and vitamins and contains up to 60% of lauric acid. Coconut Oil is perfectly suited for cooking and baking and can also be used for beauty care. Even your pet will enjoy Coconut Oil. Protect your dog or cat against ticks and your horse against horse flies. Give it a try! Coconut oil constitutes an integral part of any healthy kitchen. It adds a unique flavor to Asian dishes as well as desserts and pastries. Coconut oil generally benefits all kinds of dishes. Due to its nutrient density, it is a real source for physical well-being. Simply add a spoonful to your daily yoghurt, muesli or fruit juice. Coconut oil is also perfectly suited for oil treatments and Ayurvedic oil-pulling. An oil that helps you lose weight? That’s got to be coconut oil! Those medium-chain triglycerides in coconut oil are processed into energy right away instead of being transferred to your fat depots. At the same time, there is less of an increase in blood sugar levels and fat burning processes are boosted. No other oil can offer this unique composition of properties. For baking and cooking, simply substitute butter and other fats with coconut oil and reduce your daily calorie intake automatically and with ease. When it comes to beauty care, coconut oil is a real all-rounder. It gives you silky hair and relaxes irritated scalps. When done regularly, a small amount of coconut oil applied to the ends of your hair will put a stop to brittle hair and split ends. Coconut oil provides your skin with moisture and protects it against free radicals. Use coconut oil for skin care and to prevent dry lips. Due to its high levels of lauric acid, coconut oil has an antimicrobial effect and can even be used to enhance your deodorant’s performance. Learn more about the various uses of coconut oil here. Even our pets can benefit from all the good qualities of coconut oil. Use it for grooming your pet or massage it onto dry areas of your pet’s skin. Help your horse deal with summer eczema and protect your cat against ticks with coconut oil. Your pet will appreciate those bonus cuddle sessions. 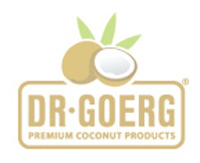 Dr. Goerg offers a special Organic Coconut Oil for Animals.